Five people suffered unspecified injuries when a Delta Airlines flight headed from Southern California to Seattle encountered severe turbulence and was forced to make an emergency landing in Reno. Reno-Tahoe International Airport spokesman Brian Kulpin said three of the passengers were transported to a local hospital Wednesday where their conditions were not immediately known. A spokesman for the Federal Aviation Administration confirmed Compass Flight 5763 out of John Wayne Airport in Orange County was diverted to Reno and landed without further incident at about 1 p.m. after the crew reported the turbulence at about 34,000 feet. The National Weather Service had warned earlier Wednesday that a strong winter storm moving into the region could create dangerous flying conditions with extreme turbulence. A winter storm warning is in effect for the Lake Tahoe area through 11 p.m. Thursday. Video posted to social media showed a chaotic scene after the plane had landed. 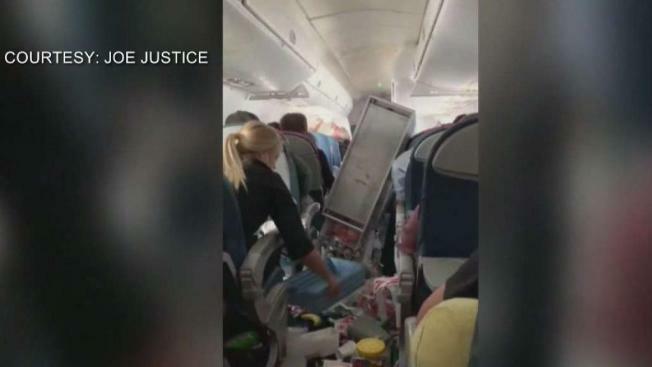 A drink cart was overturned, and people were collecting themselves after the turbulence. "We did a nose dive, twice," the Twitter user said.